I've found a crease, what do I do? Crease lines, wrinkles or ripples on your artificial grass is actually normal. It is not defective. Large rolls are placed on digital cutting machines, where the grass is run through, measured, cut and wrapped ready for dispatch. To try to ensure that the grass gets to our customers in perfect condition it is important that we wrap the grass tightly around a thick cardboard tube. Due to this process, when the grass is first opened and unrolled at its destination, it’s quite normal for the grass to look very flat and ‘lifeless’. On some occasions there may well be some creases or feint lines in the product. There are several reasons why this may happen. It can be from the process of it running it through the cutting machine, reverse rolling it, cardboard tube has broken inside or become warped, or from where the product has been tightly wound onto tube. It can also be due to being exposed on harsh environmental conditions for a long period of time if not handled with care. But don't worry! This can be easily fixed. There are no tools required. You just need a bit of sunshine, patience, and time. Roll out your grass fully and leave it for at least an hour or two to warm through. The warmth can soften the backing and reduce the crease line. This will make it easy for you to pull or stretch out. If it's still creased, brush the grass on and around the affected area. If the crease is near the edge, pull on the edge to straighten it out. Leave it for 20 minutes to settle. Flip it over and pull the area out again. 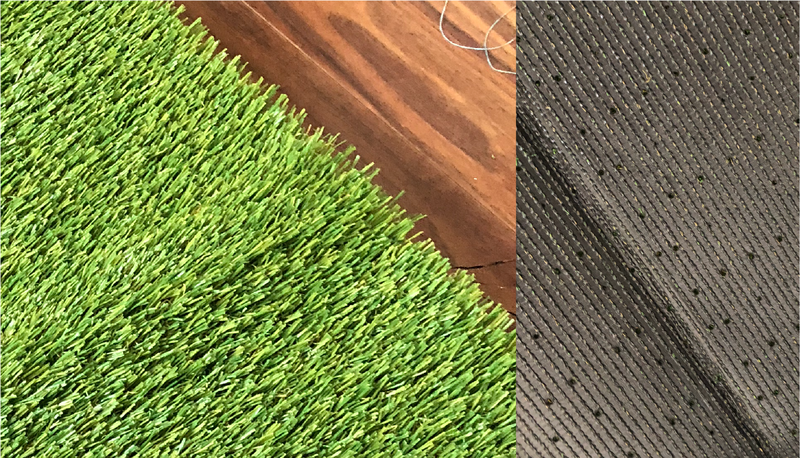 Roll up your artificial grass tight and leave it for 1-2 days. This will help stretch the backing and adjust to its original shape and form. Prior to installing the turf, it is important to lay the turf flat for at least 1 to 2 hours before installation. This will allow the turf to conform to the base material and reduce the chances of wrinkles. Allowing your turf to breathe after being packed can help soften the backing to reduce crease line. If you have installed a weed membrane, make sure it is laid flat and hasn't bunched up or folded over. Allow your grass to acclimatise before cutting. Always run grain of turf in the same direction. Use a 2 x 4 (straight line installation) or 1 x 2 (curve line installation) of synthetic or pressure treated wood bender board around the perimeter of turf area to frame and protect the turf from soil and debris. Use only manufacturer recommended infill materials. Infill amount will vary. A 100 Ib. bag of infill will typically cover a 60 sqft. of turf. Never drive nails too far into the base because this will create a noticeable dip.